(RRP £299.99). 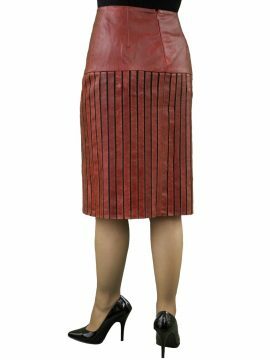 A stylish, smart and versatile fishtail leather skirt which can be worn on many different occasions, day or evening. It is beautifully tailored in fine quality soft lambskin nappa and has curved panel seams and fishtail (fluted) bottom edging. The skirt reaches down to a little below the knee (Length 23.5in) and is designed to be close-fitting. By Ashwood. Available in black and soft matt red. A beautiful fishtail leather skirt tailored in soft fine quality lambskin nappa. It is a below knee length and is tailored to be close-fitting. Suitable for smart wear, day or evening.